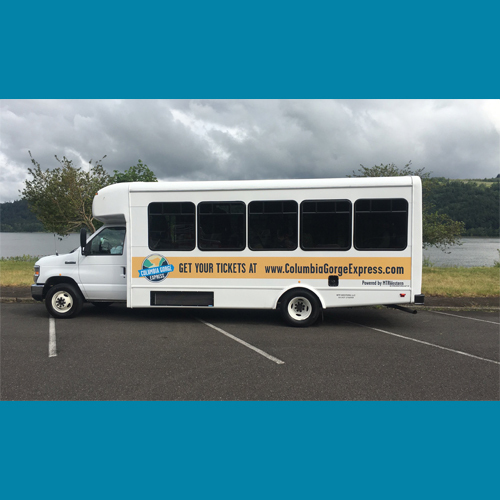 TRAVEL COLUMBIA RIVER GORGE: The Columbia River Gorge Express Starts Today! The Columbia River Gorge Express starts it's route today! There is now a way to connect Portland to the beautiful gorge. The hopes of this project is to reduce congestion in the parking lot of the Multnomah Falls trail head. The Oregon Department of Transportation and the U.S. Forest Service, which manages the falls, are hoping to alleviate some of that pain with a brand new bus service that will connect Portland with the Columbia River Gorge. 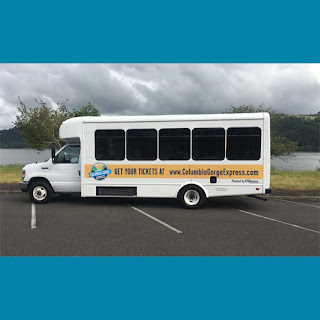 The shuttle bus, dubbed the Columbia River Gorge Express, officially begins service this Friday, May 27, running every Friday, Saturday and Sunday through Sept. 25. The bus will run 12 times daily between the Gateway Transit Center in northeast Portland and the Multnomah Falls visitor center, with one stop at Rooster Rock State Park on the way. The bus ride is expected to take about 35 minutes each way, and will cost $5 for a round-trip ticket. Riders who board at Rooster Rock can ride to Multnomah Falls for free, and can even park at the state park free of charge. Each of the three shuttle buses on the express route can carry up to 20 passengers, with racks that can fit three bicycles. "The Gorge is home to some of our most beloved outdoor attractions," Rian Windsheimer, Oregon Department of Transportation manager for the Portland area, said in a press release. "Adding this transit service is intended to help ease congestion, improve safety, relieve the parking crunch and make these areas accessible to more Oregonians." The bus service will be a two-year pilot program, attempting to alleviate some of the congestion at Multnomah Falls which often backs up onto the left lane of Interstate 84. The parking lot at the falls closed 181 times due to overcrowding over the last 22 months, according to the department. Of those, 129 closures came on Fridays, Saturdays and Sundays. Officials with the U.S. Forest Service are also in support of the bus service, but remain cautiously optimistic about its effects on the Multnomah Falls congestion, acknowledging the potential for unintended consequences. Seeking a resolution, officials conducted a survey this past January, gauging interest in public transit. More than 70 percent of respondents said they would consider public transportation or shuttle buses to the Gorge. "I'm not sure how much it will actually reduce the number of cars on the historic highway – it may actually add more people to the site," said Stan Hinatsu, recreation staff officer for the Columbia River Gorge Scenic Area. "But we do really think it is a good start to solving the congestion."